Those look really good. I’m out of eggs (and in my attempts to use all of the perishables getting low in the butter department), so I wonder what would be best as a substitute for the eggs. I made these recently too. Yours look so fantastic!! Love them! your blog is awesome. i want to try the low fat chocolate muffins first but these look good. next time someone who follows a recipe says they want a refund, tell them there’s a $50 charge per word for every negative comment on your blog. How ’bout if you pay me to try them, then if I like them I’ll pay you back :0) That should top the refund one!! They sound good, snickerdoodle anything has to be good! I posted this same recipe! I can’t remember where I foudn the recipe, but I LOVED them!!!! They were definately a nice change from the regular flavors of muffins! okay, so I just went out and bought the tartar. I made the muffins and they were awesome… but where does the nutmeg go??? Oops!! I hate nutmeg so I left it out, I should have noted that. Look at the link to the original recipe to see the nutmeg part. Sorry! I’ll fix it later! lol, I dont like nutmeg either, so I skipped it. Ive made these twice to RAVE reviews, and people keep asking for the recipe. This is the only thing I’ve baked in weeks that my housemates have eaten all of without my prompting! 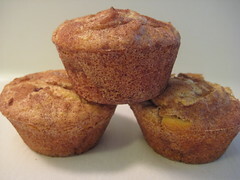 Since there was no direction about the nutmeg, I put it on the inside of the muffin (with the flour, etc.) rather than in the coating. My friends and I do this with our shortbread too, it’s our secret ingredient. I don’t know if this is where the nutmeg was originally supposed to go, but for people who do like nutmeg, it’s great!